Heartburn drugs can have rare but serious side effects, such as increased risk of bacterial infection and bone fracture. (Health.com) -- Too many people in the U.S. may be taking stomach-acid-suppressing drugs such as Nexium and Prevacid, new research suggests. 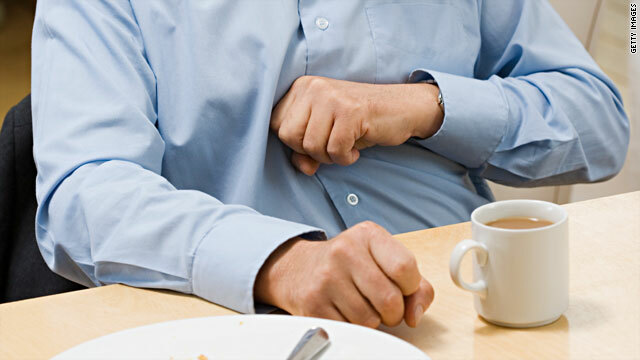 The drugs, known as proton pump inhibitors, help those with serious stomach and digestive problems, but the risks may outweigh the benefits for people with less serious conditions, experts say. Proton pump inhibitors can have rare but serious side effects, including an increased risk of bacterial infection and bone fracture, according to several new studies in the Archives of Internal Medicine. Proton pump inhibitors are among the most commonly prescribed drugs in the U.S. In 2009, they were the third-largest class of drug in the country with $13.6 billion in sales, representing more than 110 million prescriptions, according to IMS Health, a health-care market research firm. Nexium and Prevacid (which is also available as a generic drug, lansoprazole) are the two most popular proton pump inhibitors, according to the most recent government data. Other drugs in the class include Prilosec, Zegerid, Protonix, and Aciphex. "These medications definitely have benefits for a vast number of patients, but they also carry some really meaningful risks of diseases that can be catastrophic," says Dr. Michael Howell, the lead author of one of the studies and the director of critical-care quality at Beth Israel Deaconess Medical Center in Boston. "Every doctor should look at every patient and give them the lowest level of gastric acid suppression that they think is safe. For many patients, that would be none." Two of the new studies found that proton pump inhibitors are associated with an increased risk of infection from the bacterium Clostridium difficile, a hard-to-treat intestinal infection that can occur in people taking antibiotics. C. difficile typically results in severe diarrhea but can lead to removal of the colon or even death in extreme cases. C. difficile can be picked up in hospitals, but stomach acid seems to protect against the bacteria. Taking acid-suppressing drugs may allow the bacteria to gain a foothold, which can result in infection. C. difficile infection "is an awful disease, and we felt we were seeing more of it," says Howell. In one of the studies, Howell and his colleagues examined data from more than 100,000 patients hospitalized for conditions ranging from cancer to dehydration. People who took a proton pump inhibitor once a day had a 74 percent increased risk of acquiring a C. difficile infection in the hospital, the researchers found, while people who took the drugs more frequently were at more than twice the risk of infection. The overall risk was small, however. The rate of infection was 0.9 percent and 1.4 percent in those taking the drugs daily and more than once a day, respectively, compared to 0.3 percent in individuals who didn't receive any acid-suppression therapy. In another study, conducted by a separate research team, patients who were already being treated for C. difficile infections and took a proton pump inhibitor were 42 percent more likely to see the infection return compared to similar patients who didn't take the drugs. "There are benefits to using PPIs, but as we move forward I think we need to really look at the indications, given that there are benefits but also risks for each individual patient," says Dr. Amy Linsky, lead author of that study and a fellow in internal medicine at Boston Medical Center. The studies are part of a special theme issue of the Archives of Internal Medicine, the first in a new series examining the downside of overusing medical care. Dr. Mitchell Katz, the director of the San Francisco Department of Public Health and author of an editorial accompanying the studies, estimates that 30 percent to 40 percent of the people who take proton pump inhibitors need them for health problems such as ulcers and Barrett's esophagus, a precancerous condition in which the lining of the esophagus is damaged by excess stomach acid. But the remaining 60 percent to 70 percent -- who take the drugs for more common conditions such as indigestion and heartburn -- probably don't need them or should try lifestyle changes before resorting to medication, he adds. "As a culture, we tend to want a pill to deal with our problems, when a lot of people could reduce their heartburn by eating smaller meals, drinking less alcohol, or not smoking," Katz says. "Clearly there are people who benefit. But when 60 percent to 70 percent of people don't need to be taking it, that's a huge problem." Drug manufacturers (including AstraZeneca, the maker of Nexium) could not be reached for comment. According to Katz, the "risk-benefit ratio" of proton pump inhibitors has shifted in recent years. "When [proton pump inhibitors] first came out, people felt they had no side effects," he says. "Now you're talking about increased fractures, increased C. difficile infection, increased rates of pneumonia. The balance has changed." Indeed, another study in the journal found that proton pump inhibitors increased the risk of certain bone fractures. Researchers analyzed data on more than 161,000 postmenopausal women from around the country and found that taking proton pump inhibitors increased the risk of spine fractures by 47 percent and forearm and wrist fractures by about 25 percent. It's not clear why the long-term use of proton pump inhibitors might lead to more broken bones. In the study, PPI use did not appear to affect bone mineral density. According to the researchers, suppressing stomach acid may interfere with the ability of the intestine to absorb calcium, a mineral critical to keeping bones strong. Women in their postmenopausal years are often urged to take calcium supplements to counter the inevitable effects of aging on bones, but in the study, calcium supplements didn't seem to have an effect on the number of fractures. Taken together, these studies suggest that proton pump inhibitors are overprescribed, Katz says. And when they are prescribed, the doses may be too high. Yet another study, a meta-analysis of seven clinical trials involving about 1,150 patients with bleeding ulcers, found that higher doses of proton pump inhibitors did not reduce the risk of additional bleeding, need for surgery, or death more effectively than lower doses did. Proton pump inhibitors "reinforce the idea that the solution to behavioral health issues is to take a pill, and that's just not how we're going to get healthier," says Katz. "Consumers need to ask their doctors, 'Why am I taking this? Do I still need this? Do I have an alternative?'"